about about the Roman Conquest of Germany at the end of the 1st Century BC. The Player represents the governor with two objectives. The first is the public one of conquering Germany as far as the Weser and establishing a new Imperial Frontier. the second of increasing his personal fortune. The activities of the German Tribes are determined by a set of rules. Gangs of Rome is a new miniatures game of street fighting in Ancient Rome (yes, it was a thing). It’s actually a game I have thought about for years, going back to several books I read describing Roman politics as a blood sport. The rules are free for now, and there are dedicated miniatures and other things you can buy. Check out their Facebook page. Imperium: From Republic to Emprie is a free print-and-play game of political intrigue in the Roman Empire. It’s billed as an alternative to the classic, much-sought-after Republic of Rome. 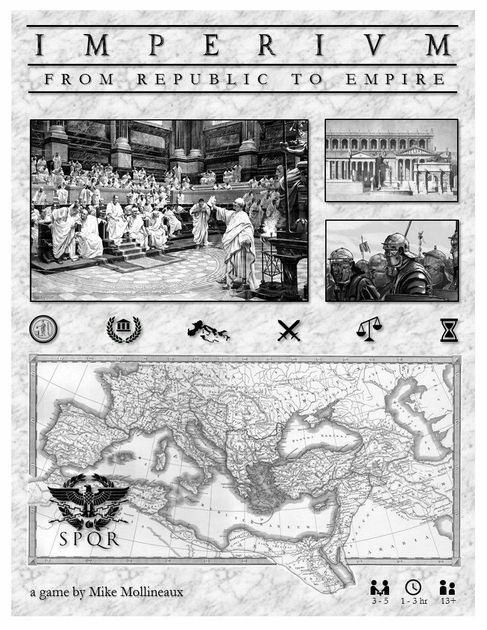 In Imperium: From Republic to Empire, players control factions of influential Roman Senators, each with a unique combination of military skill, political skill, and ideology. Factions gain prestige points by successfully leveraging the strengths of their senators, political opportunities, senatorial influence, and treasuries as they engage in various aspects of Roman politics. Prestige is earned by being elected to high office, success in war, sponsoring public games, earning nobility, enacting justice, and persuading other senators to join their faction. Prestige can also be lost through military failures and by being convicted of corruption. Victory is declared when one senator or faction has gained sufficient prestige as to be crowned the First Emperor of Rome. However, success will require both competition and cooperation as all factions must work together to ensure the stability of Rome. Failures of the Senate and unmet public demand will increase civil unrest, leading to revolt. Excessive war involvement will overextend Rome’s military resources. Spending more funds than what is available will bankrupt the State Treasury. Any of these situations will ensure the fall of Rome causing all players to lose the game. Throughout the game, actions are numerically resolved using senators’ individual attributes, shared State resources, faction resources, and dice. Primary mechanics include probability modification, resource management, and blind bidding. The game is played over a number of rounds until a victory condition is met or until all players are defeated by the game. Each round is made up of six distinct phases, played in the following order: Election Phase: Each player nominates a candidate from their faction to compete for office. The candidates with the most votes (prestige + bribes) are elected to the offices of Consul and Censor. The Consuls will co-lead Rome in political and military affairs while the Censor will be responsible to convict members of the Senate accused of corruption. Minor offices are also assigned to other senators who may also sponsor public games from their faction treasuries to earn prestige and to placate the public. Senate Phase: Senators gather to make decisions related to Rome’s resources. Each resource (gold and legions) is distributed proportionally to all factions based upon the relative number of senators in each faction. Each faction then applies gold to various “proposals” such as the purchase of Public Grain or the raising of additional Legions. Each faction applies available legions to the wars of their choosing. Consuls choose which armies to lead into battle. But beware—an ‘Assassin’ or ‘Mob Incitement’ card in the hands of a jealous senator can severely upset the balance of senatorial power. Republic Phase: Factions take turns making decisions and resolving actions related to their senators working throughout the Republic. Players may choose to have certain senators engage in corruption to gain funds for their faction treasuries. Auxiliary legions may be hired by governors to enhance provincial defenses. Senators in Rome may also attempt to persuade senators to join their faction by the subtle application of personal prestige, ideological attraction, and bribery. Rome must also respond to random events such as public demands, barbarian raids, provincial insurrection, and plagues. War Phase: Wars are now resolved. If victorious, the general returns to Rome with additional prestige and the potential of war spoils. A stalemate will cause the general to return to Rome having lost prestige due to eroding public confidence. A defeat will end in death for the general, an increase in public unrest, and the affected province being overrun. Victorious generals also have the option of “crossing the Rubicon” to engage in civil war with the Roman State in an attempt to secure an early win. Trial Phase: The Censor will prosecute corruption charges of the Senate. For each successful conviction, the Censor gains additional prestige while the accused may either lose prestige or (in the case of murder or treason) be executed. Intersession Phase: Senators may die randomly of natural causes. For those senators who survive the mortality roll, victory conditions are checked. Victory is declared when one faction’s senator has earned 12 prestige points or when a faction has accumulated a total of 30 prestige points. Otherwise, the game is reset for the next round of play. Imperium: From Republic to Empire was designed to be a simplified, less time-consuming alternative to Republic of Rome (Avalon Hill, 1990; Valley Games).